"I highly recommend Dr Georgios Karas if you are seeking a diagnosis of your MRI scans. The interpretation of my scans were very quick, thorough and precise. Conditions were picked up that were not highlighted on another interpretation. Dr Karas ensured that all of my questions and concerns regarding his interpretation were addressed to relieve my worry. Professional expertise, Patient care, Communication, all score 10 out of 10. I can’t find any area that was not perfect. On top of that Dr Georgios Karas is really passionate about his work and a really nice guy who puts you at ease throughout the whole process. Thank you so much for helping me Dr Karas, Best wishes, Paul." 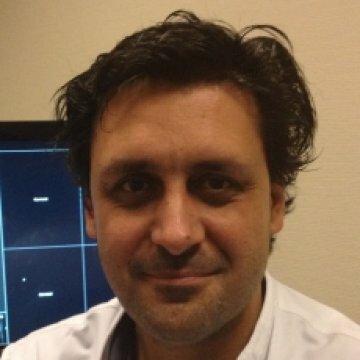 I have been working with neuroradiology scans since 1999 and almost 10 years of experience as a consultant radiologist. I have extensive experience in spine (hernia, lower and upper back, failed back syndrome), dementia (Alzheimer's and other dementia), stroke (brain stroke, carotid imaging), and multiple sclerosis. Prompt and very structured opinion on my brain MRI. In line with following later evaluation by slovak MD. I was happy to know MRI evalution within 48 hours. He is always um very through in his reporting. Answers questions clear. I wish I could see him in person. Wonderful news! I very much appreciate your time and expertise, Dr. Karas. So glad to get your second opinion. I will take your advice regarding further imaging of the cervical spine. Thanks again. You've put my mind at ease. Mr. Karas really explained clearly his findings and he was a pleasure to deal with. He took a genuine interest in my case and I felt he was very caring and understanding. His report was very clear and concise and his recommendations are very helpful. I would highly recommend Mr. Karas because he is good at what he does and thoughtful as well. You can be sure he will give you the understanding you need and a clear and concise opinion. I think the report was promptly written, very clear, very professional. Given the pace of most healthcare systems, the time provided to ask follow up questions is ridiculously short. I had to wait 6 weeks to see my specialist to share this report with him, from which I now have some questions, and I can't ask them. Of course there has to be a deadline, but so short?? I am very thankful to Dr Karas! He did not only answered the questions I had (regarding the functions of my muscles directed by my lower cranial nerves), he dd also found the probable source of my problems (the internal jugular vein is compressing them). His advice on future actions feels very accurate. Thanks to him I might get back my life. Once again and outstanding expert interpretation of my scans with the patience and skill to help me understand my situation. Thank you so much Dr Karas. Paul. Super flexible with urgent queries! Many thanks for confirming our fears. The report was delivered on time with a lot of useful information and advices , i would highly recommend Dr. Georgios Karas. I highly recommend Dr Georgios Karas if you are seeking a diagnosis of your MRI scans. The interpretation of my scans were very quick, thorough and precise. Conditions were picked up that were not highlighted on another interpretation. Dr Karas ensured that all of my questions and concerns regarding his interpretation were addressed to relieve my worry. Professional expertise, Patient care, Communication, all score 10 out of 10. I can’t find any area that was not perfect. On top of that Dr Georgios Karas is really passionate about his work and a really nice guy who puts you at ease throughout the whole process. Thank you so much for helping me Dr Karas, Best wishes, Paul. Our experience with diagnose.me and Dr. Karas is excellent. Despite the negative outcome from the received second opinion, the help and support were both great from the doctor as from the backoffice as well. All our problems and questions were dealt with within very limited time. Because we needed the report very quickly, it was even delivered to us within one working day in stead of the expected 2 working days. A foreign friend of mine in Ukraine needed the second opinion and after the examination, the report was translated within days into Russian as well to use it in hospital over there. Again many thanks for your remarkable and excellent help. I would highly recommend both the organisation and the doctor, if you might need a similar second opinion. Prompt and detailed answers to my MRI scan request. The information provided was well explained and it gave me a very good understanding of my medical situation, as requested. I would not hesitate to recommend Dr. Georgios Karas to other people. Need for prolonged immunosupressive therapy in CLIPPERS--a case report. Wijntjes J, Wouda EJ, Siegert CE, Karas GB, Vlaar AM. BMC Neurol. 2013 May 24;13:49. doi: 10.1186/1471-2377-13-49. Accelerating regional atrophy rates in the progression from normal aging to Alzheimer's disease. Sluimer JD, van der Flier WM, Karas GB, van Schijndel R, Barnes J, Boyes RG, Cover KS, Olabarriaga SD, Fox NC, Scheltens P, Vrenken H, Barkhof F. Eur Radiol. 2009 Dec;19(12):2826-33. doi: 10.1007/s00330-009-1512-5. Epub 2009 Jul 18. Lesional magnetization transfer ratio: a feasible outcome for remyelinating treatment trials in multiple sclerosis. van den Elskamp IJ, Knol DL, Vrenken H, Karas G, Meijerman A, Filippi M, Kappos L, Fazekas F, Wagner K, Pohl C, Sandbrink R, Polman CH, Uitdehaag BM, Barkhof F. Mult Scler. 2010 Jun;16(6):660-9. doi: 10.1177/1352458510364630. Epub 2010 Mar 29. Feature extraction and strategy of analyzing structural neuroimaging in dementia. Karas G, Scheltens P, Barkhof F. Handb Clin Neurol. 2008;89:75-86. doi: 10.1016/S0072-9752(07)01206-7. No abstract available. Whole-brain atrophy rate and cognitive decline: longitudinal MR study of memory clinic patients. Sluimer JD, van der Flier WM, Karas GB, Fox NC, Scheltens P, Barkhof F, Vrenken H. Radiology. 2008 Aug;248(2):590-8. doi: 10.1148/radiol.2482070938. Epub 2008 Jun 23. Amnestic mild cognitive impairment: structural MR imaging findings predictive of conversion to Alzheimer disease. Karas G, Sluimer J, Goekoop R, van der Flier W, Rombouts SA, Vrenken H, Scheltens P, Fox N, Barkhof F. AJNR Am J Neuroradiol. 2008 May;29(5):944-9. doi: 10.3174/ajnr.A0949. Epub 2008 Feb 22. Precuneus atrophy in early-onset Alzheimer's disease: a morphometric structural MRI study. Karas G, Scheltens P, Rombouts S, van Schijndel R, Klein M, Jones B, van der Flier W, Vrenken H, Barkhof F. Neuroradiology. 2007 Dec;49(12):967-76. Epub 2007 Oct 23. Global and local gray matter loss in mild cognitive impairment and Alzheimer's disease. Karas GB, Scheltens P, Rombouts SA, Visser PJ, van Schijndel RA, Fox NC, Barkhof F. Neuroimage. 2004 Oct;23(2):708-16.
van Straaten EC, Scheltens P, Knol DL, van Buchem MA, van Dijk EJ, Hofman PA, Karas G, Kjartansson O, de Leeuw FE, Prins ND, Schmidt R, Visser MC, Weinstein HC, Barkhof F. Stroke. 2003 Aug;34(8):1907-12. Epub 2003 Jul 10. A comprehensive study of gray matter loss in patients with Alzheimer's disease using optimized voxel-based morphometry. Karas GB, Burton EJ, Rombouts SA, van Schijndel RA, O'Brien JT, Scheltens Ph, McKeith IG, Williams D, Ballard C, Barkhof F. Neuroimage. 2003 Apr;18(4):895-907. Patterns of cerebral atrophy in dementia with Lewy bodies using voxel-based morphometry. Burton EJ, Karas G, Paling SM, Barber R, Williams ED, Ballard CG, McKeith IG, Scheltens P, Barkhof F, O'Brien JT. Neuroimage. 2002 Oct;17(2):618-30. T1 hypointensities and axonal loss. Barkhof F, Karas GB, van Walderveen MA. Neuroimaging Clin N Am. 2000 Nov;10(4):739-52 ,ix. Review.